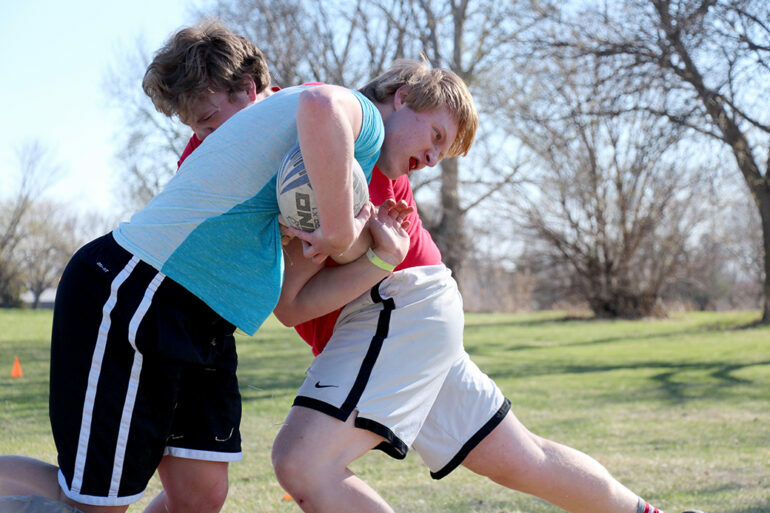 The University of South Dakota Men’s Rugby Club has been trying to build its roster back up to field a full squad over the past two years. David Middlebrooks, the club’s team president, has been involved with the club rugby team at USD since 2007, and said the numbers have declined greatly since he joined. “When I first got involved with the rugby team I would say we had at least 20 guys on the squad, and just last year we only had three guys on the team,” Middlebrooks said. Middlebrooks and the club’s vice president, Kevin McLaughlin, began heavily recruiting last fall to reverse this trend. Middlebrooks and McLaughlin said getting first-years involved is the easiest way to increase numbers. Along with recruiting first-years to join the club, Middlebrooks believes the rugby team needs to get involved in the fraternity life again. When Middlebrooks first got involved with the Men’s Rugby Club, he said the numbers were greater because the club had strong involvement with the fraternities on campus. First-year member Tyler Audino said he saw the rugby table set up at the Muenster University Center and decided he would give it a shot. No matter the reason why someone decides to join the club, Middlebrooks and McLaughlin said teaching the new members the sport of rugby is a challenge. McLaughlin said most of the men who join the club either played football in high school or at least understand football, and the biggest adjustment a lot of the men have to learn is that rugby never stops. For Audino, the continuous aspect of rugby was one of the hardest things to adapt to. McLaughlin and Middlebrooks said it takes a while for some of the new players to understand the game. Practice and competing consistently is the best way to learn the game, they said. The rugby team practices twice a week at the field north of Highway 50 and works to learn the sport and practice proper technique and fundamentals. Besides practicing, the team plays five or six games a semester and even competes at tournaments on weekends, if possible. Because USD only has 12 members on its team, it combines with other teams or players to complete a full squad of 15 members. McLaughlin and Middlebrooks are hoping that with their recruiting efforts the numbers for their team will increase and they will be able to compete as a full side without having to borrow or combine with other teams in the future.